Let students enjoy cooperative learning with a double-sided preschool writing center. Preschool writing centers let you keep everything you need to get your students writing right where you want it. With a built-in literature organizer and additional storage below, you can organize papers, crayons, scissors and more. Shelving and cubbies make it exceptionally easy to save writing center activities from year to year and ensure that little ones enjoy hands-on learning. 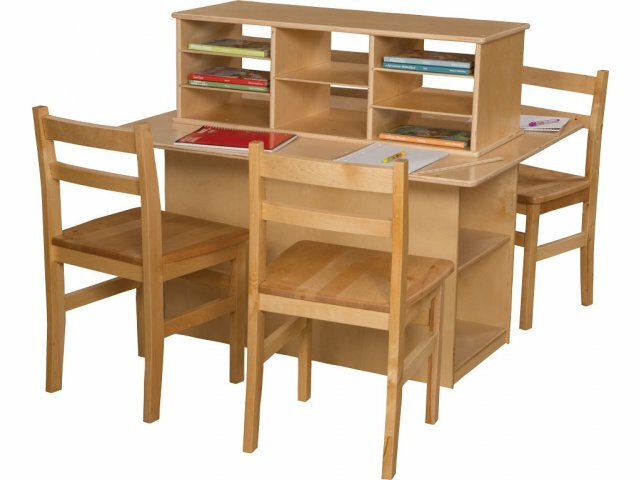 Wood Designs writing stations are designed to maximize safety and durability. All corners and edges are fully-rounded and the plywood body is protected by a triple coat Tuff-Gloss UV finish. 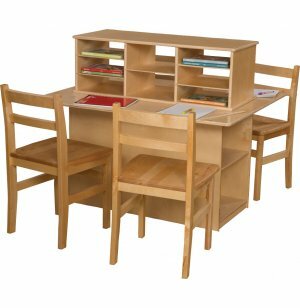 This all-in-one preschool writing center creates the perfect learning area for an early-childhood, pre-k or kindergarten classroom. Perfect Size: Work surface height is 24", ideal for preschool-aged children. Abundant Storage: A literature organizer and additional storage under the surface provide plenty of space for supplies.